This was the first of the long-running Byrne and Balzao novel’s that Auntie M has had the pleasure to read, but it certainly won’t the last. 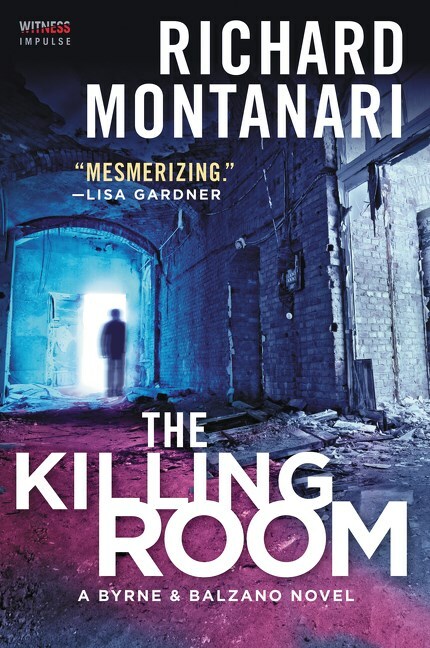 She loves when she finds a new series to dig into, and she will now go back and read what leads up to the action in Richard Montanari’s newest, The Killing Room. Set in Philadelphia neighborhoods, from its highest to its lowest, an abandoned church becomes the setting for the team’s latest murder. Despite its brutality, neither detective is prepared when a second body and then a third is found, also in deconsecrated churches, all in different methods of horrific brutality causing the death of the victim. For the seasoned detectives, the crimes are more than disturbing and hit them on a personal level in different ways. It only adds to Byrne’s stress that he’s taken on trying to be a kind of mentor to troubled young teen. With an obvious killer seemingly ahead of them at each step, the two homicide detectives will need all of their smarts to outwit the chilling killer. The ties to the Church and theology are fascinating and an important clue will come to them from an unlikely source. The interplay between senior partner Kevin Byrne, living alone with his daughter at college, and the younger Jessica Balzano, married to a detective and with a young family at home, is a highlight of the series where two professionals who have each other’s back can exist in well-practiced teamwork that allows them to mine each other’s strengths. Readers who haven’t discovered this series, like Auntie M, will find themselves hunting for the previous novels on the strength of this absorbing story.